This is an old single-threaded benchmark utility but I've tracked this over the years and would love to see what people are getting with their processors. UPDATE 3/16/12: Please update with what you have. I'd really love to see your Sandy Bridge scores! It's a single-threaded benchmark utility. I could have sworn there was a similar thread last year, and this year it'll be even more useless. This is not a single-core pnis measuring contest. Personally my work is stuck in a single-threaded world and it's helpful to know where cores are at for this type of benchmark, which is relevant to the apps that I use. That said, its also interesting to see where newer cores measure up in this capacity, having tracked it for the last 10 years. during the test it switches to different cores all the time, why is this? Interesting. I haven't seen that before but am guessing that might have to do with the OS/drivers. Great, thx. What was "over 700 on air"?...was that a joke? Funny that some people posted their scores with no hardware references, wtf, lol. Does 8 thread consider as 8 core? No it had a link to an image but it was not imported from FT since it was defunct. Moral of the story, set your affinities for your single-threaded applications. I looked up the cpu line at newegg...someone claims to have overclocked the W3550 (3.06ghz) to 4950ghz on air...do you have any insight whether that is credible or not? I haven't followed processors since I bought my e8600. 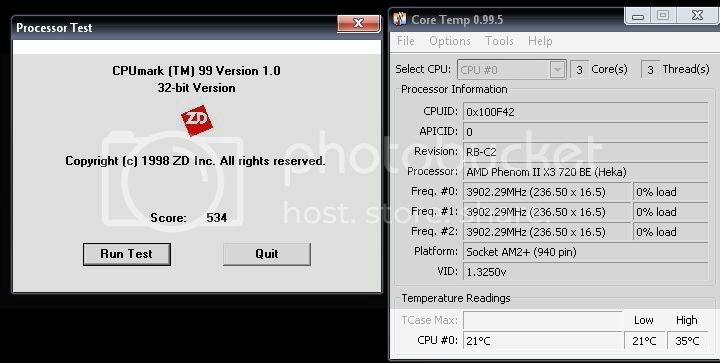 How well has the 3520 been working for you at 4500ghz (if it still is), and I'm assuming this a workstation? Lastly, what motherboard, ram, cpu heatsink are you using? This was what I'm looking for, info on whether or not there is value for an upgrade in the near future. I'm not there at this moment financially, but with the benchmark you get at 700, its right there for my minimum speed increase needed for justification. For that matter, if I got 4950ghz with a xeon 3550, and for example if the Cpumark99 benchmark increased at the same rate that your 4500ghz xeon has over my 4200ghz e8600 (100 points, +15&#37 , that would be +250 points (850 score) or roughly 41% faster than what I have now. I'd be absolutely elated, even with the larger price tag of the 3550. Overclocking is a lottery, plain and simple. Case in point - I have two W3520s that overclocked and beat out three i7 975s by quite a bit! I had W3540s that were DOGS! The guy posting his air o/c (more than likely) is "benchmark stable". I just don't see that speed and voltage working on commercially available air cooling. Unless he lives in the arctic region with the box outside. Or maybe he's a butcher and the workplace allows his pc in the walk-in?! That voltage and frequency when fully stressed with a program such as Linpack is going to generate crazy heat. High end air won't work. Water cooling will if a large radiator is used. Even then I would expect mid 70s temperatures. I'm BCLK limited with this chip because of the memory configuration - I use 12GB at 7-7-7-18-1T 1693 / 1066 strap. This is on a 4X Classified X58 (762) Mobo. Cooling is achieved with a Venomous-X with a pair of Gentle Typhoon 1800RPM fans in push pull. Idle temps around 35C, load temps in the lower 60s - peak load temps lower 80s. My definition of stability and endurance are different than most people's. If the box cannot pass the harshest loading test while getting thrown on the floor while at sea along with two gorillas playing volleyball with the case - then it's of no use to me! Ok that may be slightly exaggerated. I will say those Gentle Typhoon fans are quite durable and really can take a beating without dying! For that matter, if I got 4950ghz with a xeon 3550, and for example if the Cpumark99 benchmark increased at the same rate that your 4500ghz xeon has over my 4200ghz e8600 (100 points, +15%), that would be +250 points (850 score) or roughly 41% faster than what I have now. I'd be absolutely elated, even with the larger price tag of the 3550.